Things have been looking a little pink and red lately at the store -maybe even at home. 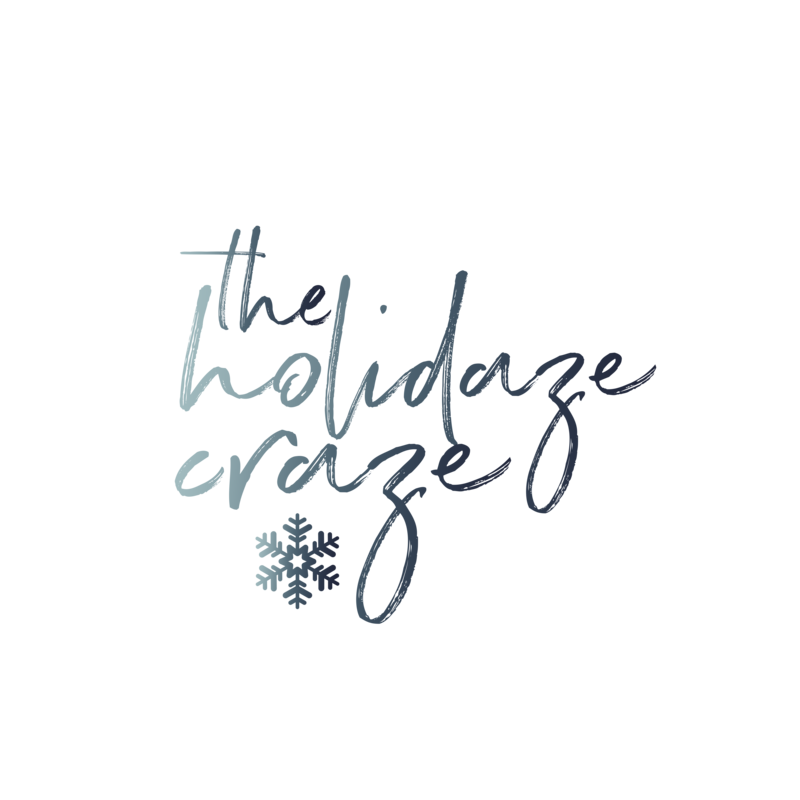 To top things off, your littles keep pulling cards and candy off the shelves and into your shopping cart. 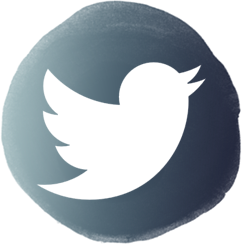 And, what’s this? An e-mail asking for help with the class Valentine’s Day party? Okay, parents, we’ve got this. My go-to for class parties is a rotation through three or four activities, with food at the end. The first center for the kiddos is usually a craft. There are a lot of super cute ones out there, but I’m in love with this handprint one. All you need is a printer (or, children who can write) for the I LOVE U! 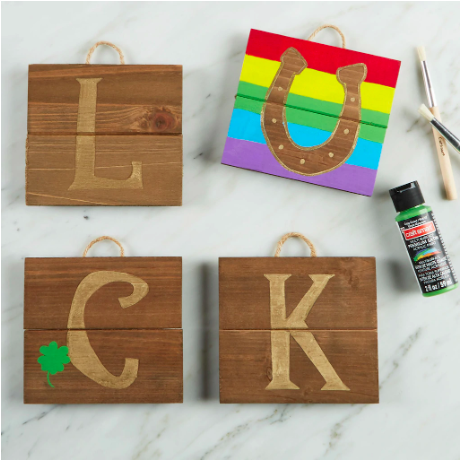 message, plus paint and hands. I’d recommend framing their art with some simple craft store borders (Michael‘s, anyone? ), washi tape, or ones they’ve colored themselves. 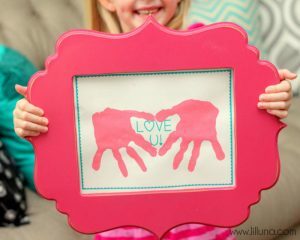 This is a perfect Valentine’s Day Craft that the kiddos can give to their parents or siblings or other family members later on. Want to unleash your inner monster? He’s a cuddly little bugger, with antennae. 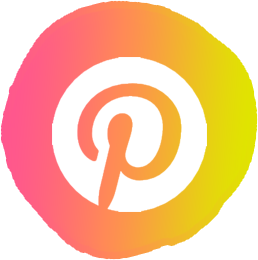 You’ll want some glue, yarn pom poms, googly eyes, pipe cleaners, and parent volunteers. Make sure the glue’s all dried before they start throwing them at each other. 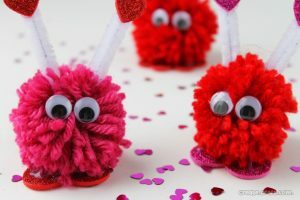 These adorable monsters are perfect for Valentine’s Day. Still got those pipe cleaners? If not, I know I saw some over at Dollar Tree. You might want to pick up some heart shapes (or, paper), and pencils or straws over there, too. As you can see, these pencil toppers are a cinch. 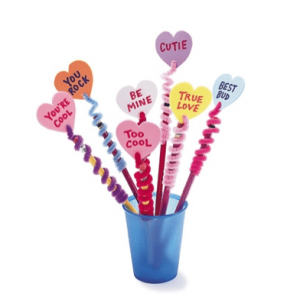 Kids write their messages on hearts, paste or tape them onto the pipe cleaners, then do the twist. Man, are we going to need a lot of pipe cleaners for this party! Plus, you’ll want a box of everyone’s favorite: Froot Loops. 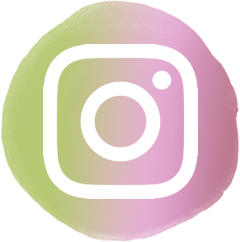 If you’ve got a ton of time, go through and pick out all the reds and purples. The rest is up to the class’ lacing skills. 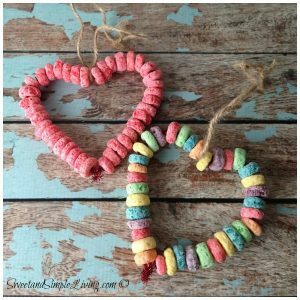 This Valentine’s Day craft is perfect because it serves as a fun activity as well as a delicious snack! Now, onto the best part of the party: food. 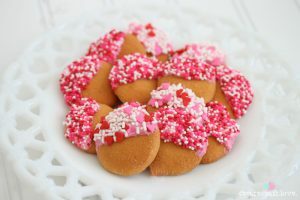 You’re going to have an easy time thinking up sugary snacks, since it is Valentine’s Day. That is why I’ve included two non-candified ideas. I’m also a sucker for strawberries. 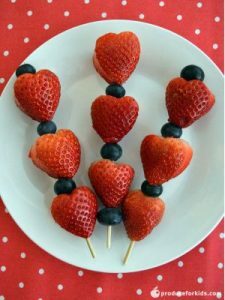 They’re Valentiney, healthy, and easy to stab on a kebab. All right, all right. I had desserts, too. 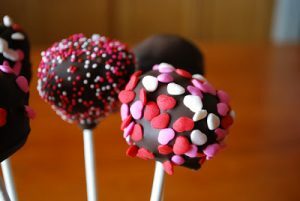 I admit that I’m also a sucker for cake pops. They’re easy and tasty, and make for great party food. Also, they’re the perfect way to use up leftover cake, or cake that didn’t exactly turn out. Everything’s better dipped in chocolate, right? I did say I had two healthy options -remember? I wouldn’t leave you hanging. 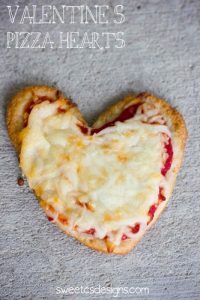 This Valentine’s Pizza is going to win you the Most Popular Vote, since it’s pretty much the only food group my first grader acknowledges. I’ll just sneak these dipped Nilla Wafers in here. If you’re like me, you just might need a quick idea like this when preparation time gets short. Yes, they’re simply cookies dipped in melted chocolate and sprinkles. Yes, you can “accidentally” leave them home and need to eat them all yourself. The other areas we break out into with the class involve games. 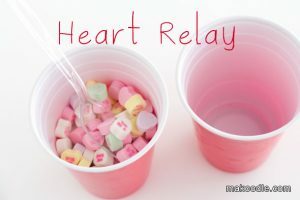 Grab a few of those drink cups you’ve purchased, plus a bag of conversation hearts, and some plastic spoons. We’re going to relay! The ecstatic participants will need to carry hearts, in the spoon, from the starting cup to wherever you’ve placed the ending one. Besides whichever team gets them all at the end, you may have to award a prize for who doesn’t cheat and eat their hearts. Feeling lazy? 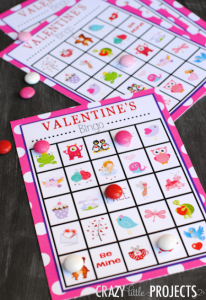 Print out some V-Day BINGO! cards. I know it’s super cute to use candy as markers, but I personally recommend ones you can’t eat. 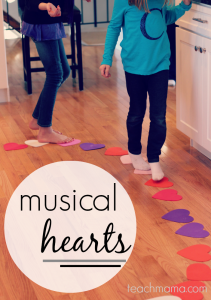 I loved this idea of Musical Hearts for another game, though I think I’d laminate them. Each heart has an action written on the other side. When the music stops, the kids need to follow the directions written on that flip side. 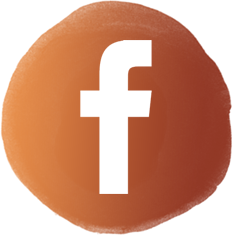 Ideas of actions include Do a Dance, Act Like a Monkey, Twirl, Sing a Song, etc. 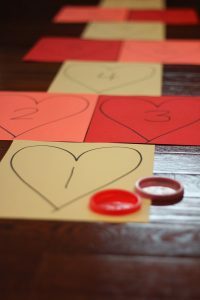 You’re getting good at crafting hearts, so let’s whip up a Hopscotch Hearts game as well. Use (washed) milk lids for the markers. I think I’ll laminate this puppy, too.